August | 2012 | Hidely Ho, Neighbors! I’m off this week, so I’m trying to spend some quality time with the kids, teaching them the important things in life that will help equip them for the years ahead. Today’s lesson: What TV Watching Was Like When I Was Your Age. We made it through most of the day today without relying on The Magic Box. By about 3PM, I had used up all my tricks and turned on the TV. Looking at the onscreen guide, I noticed that Looney Tunes was showing on Cartoon Network. Feeling nostalgic, I figured I might as well impart some knowledge while we vegetated. So I decided to describe what TV watching was like when I was their age, waaaaaaay back in the seventies. Then I realized she was right. Now if you’ll excuse me, I have to take my Metamucil, find my walker, and make it down to Hot Shoppes before 4PM. I hear the Blue Plate Special today is liver and onions. Thought I would pop my head up just long enough to give a quick update (and I was guilted into posting. If our friend CPQ can take time to post while helping her son recuperate from major surgery, I can take 5 minutes to write a sentence or two). The kids have been busy with more camps. 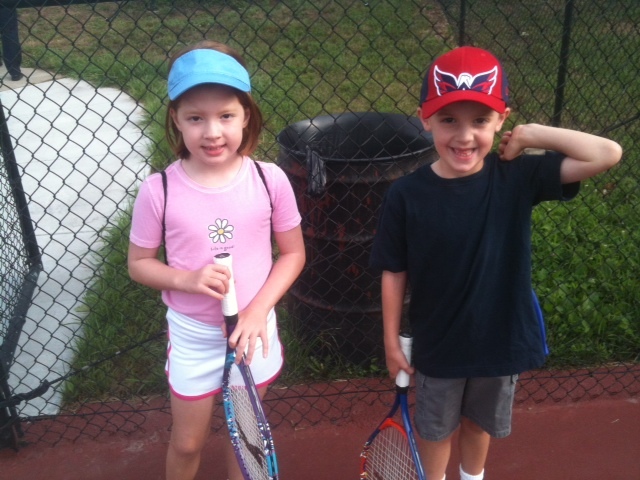 Two weeks ago was tennis camp. Sounds more highfalutin than it really was. It was offered by the county, and really consisted of a 19 year old teaching them not to hit the ball over the fence (oh yeah, he was also sick the last day, making their 5 day camp a 4 day camp). This week they are in “Pirates and Mermaids” art camp. Knowing my kids, they’ll both gravitate to the “pirates” portion of the program. J was already working an his “ARRRRRGGGH!” last night. I’ve been completely wrapped around the axle at work. Our church is planning a major expansion, and the effort is starting to ramp up. In order to consolidate some of the land we have, we’re going to move a “historic” home the church owns (since we can’t tear it down) to a property we own down they street You cannot imagine the processes involved in moving a house. The other time absorber right now is the Willow Creek Association Global Leadership Summit. Every year, the Willow Creek folks gather together some of the best business and church leaders in the world for a two day conference on leadership. It’s held live at their main campus outside Chicago, and simulcast around the world to about 60,000 people. Our church is hosting a simulcast for our area. So, until the Summit is over on Friday evening, I won’t be doing much else.